Two of the most prominent heroes of World War II learned their military leadership skills at Western Military Academy in Alton. Lt. Robert Cutler was honored for his bravery in the historic D-Day invasion in Europe and Ensign Lanson Ditto was cited for his courage in saving survivors of a sunken ship in the Pacific. Cutler was a student leader who graduated from Western Military in Alton in 1935, and Ditto was an outstanding cadet in the academy's 1938 graduating class. 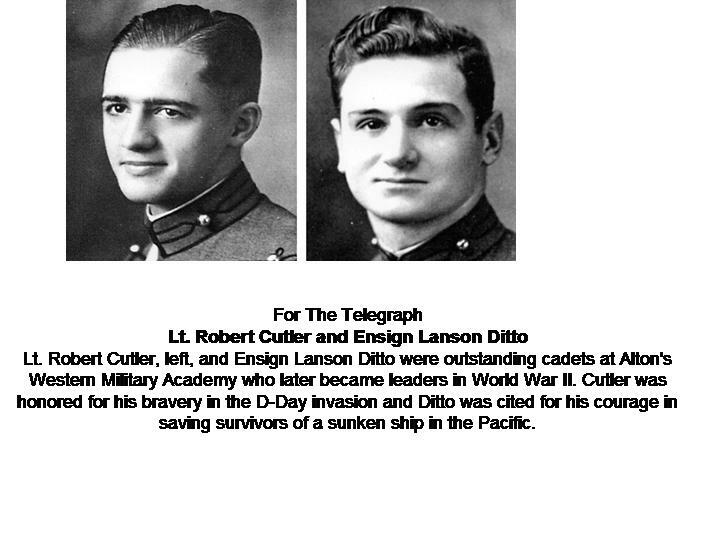 Cutler and Ditto are among the honor roll of military heroes who learned leadership and military strategy at the nationally renowned military academy in Upper Alton, said Western historian C.B. Jackson, a 1968 graduate of the academy. "They were outstanding leaders who exhibited their bravery under fire in action in the war," Jackson said. "Their early training in military leadership came at Western in Alton." First Lt. Cutler was awarded the Distinguished Service Cross for leading infantry soldiers on the beach of the Normandy invasion in the face of German machine gun fire and artillery bombardment, Jackson said. Cutler braved exploding shells to lead his infantrymen on a breakthrough of enemy lines on the Normandy beach and the danger of climbing 100-foot-tall bluffs fortified with German soldiers. Cutler showed his leadership qualities early when he came from Washington, Mo., and enrolled as a cadet at Western Military in 1931. He came to Western, which had a national reputation for training leaders in the annals of U.S. military history. Cutler excelled in studies in the classroom during his four years at Western and was elected vice president of his cadet class. The academy was founded in 1879 by Albert M. Jackson on Seminary Street in Upper Alton and graduated hundreds of outstanding young cadets until it closed in 1971. A crowd of fans gathered at the Alton athletic field and cheered Cutler, who exhibited his talent as a leading scorer on the Western football teams of the 1930s. He showed his stamina as a champion mile runner on the track team, winning the competition in two athletic leagues. He graduated in the top 10 percent of his class in 1935 and attended Washington University in St. Louis. World War II had started when Cutler graduated with a civil engineering degree from the Missouri School of Mines. The patriotic young Cutler joined the Army and his military skill learned at Western Military in Alton helped earn him a commission as a lieutenant in the famed 1st Infantry Division. Cutler's bravery on the battlefields of France in the war earned him a place on the long list of military heroes from Western Military in the fighting forces of World War II. Cutler's courage earned him the Silver Star when he took over command of the troops after the company commander was killed in the D-Day invasion. Cutler and the U.S. infantry soldiers climbed tall cliffs to defeat heavily armed German troops. "Allied troops are in Germany ahead of schedule because of your performance above and beyond the call of duty," the commander told Cutler, who was awarded the Distinguished Service Cross. Cadet Lanson Ditto graduated from Western Military in 1938 and enrolled at Washington and Lee University. When Japanese planes dropped bombs on Pearl Harbor in 1941, Ditto left the university to volunteer in the Navy as the fire control officer on the USS Langley in the South Pacific. Ditto faced danger when his ship was attacked by a squadron of Japanese bombers. Ditto and the crew fired anti-aircraft guns at the oncoming Japanese bombers. The ship was sunk and Ditto and the wounded crew were rescued from the ocean by the USS Pecos. Cadets at Western Military in Alton remembered Ditto's leadership in military training at the academy. He came from Paducah, Ky., in the early 1930s and excelled as an honor student and all-conference star athlete in football, swimming, golf and tennis. At Western, the student newspaper praised Ditto as a cadet whose character and leadership showed when he and his crew of sailors were struggling to survive in the water after their second ship was sunk. His ship, the USS Pecos, was bombed and sank on March 1, 1942. The New York Times told the amazing story of how Ditto's courage kept up the spirits of his shipmates clinging to life rafts for more than seven hours in the Pacific. "Ensign Ditto was a dynamo of energy who cheered up the men and kept us together," survivors said in describing Ditto's heroism to the New York Times. Ditto was in the naval battles supporting the landing of U.S. Marines on Guadalcanal and the Solomon Islands. In 1944, he was given command of the USS O'Toole, a Navy destroyer, which patrolled dangerous enemy waters in the North Atlantic, protecting U.S. ships from German submarines. After the war, Ditto and his family moved to Houston, where he opened a well-known men's clothing store. Ditto and Carter's heroism in the battles of World Word II is remembered in the history of Western Military Academy in Alton.